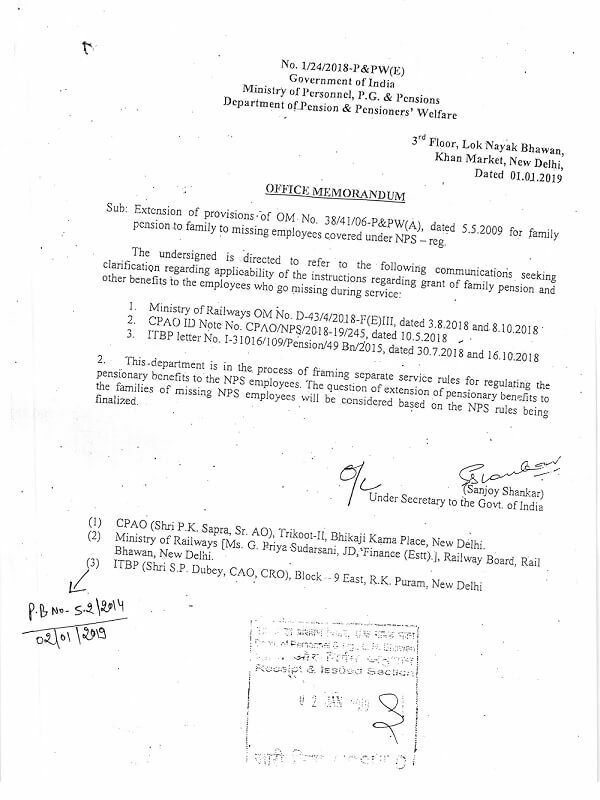 Sub:- Extension of provisions of OM No.38/41/06-P&PW (A), dated 05.05.2009 for family pension to family to missing employees covered under NPS. Attention is invited to Deptt. 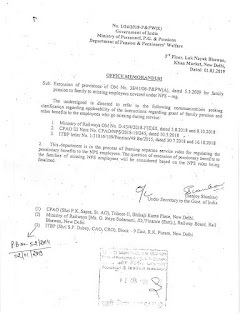 of Pensions & Pensioners Welfare OM No.1/24/2018-P&PW (E) dated 01.01.2019 (copy enclosed) wherein it is mentioned that the department is in the process of framing separate service rules for regulating the pensionary benefits. The question of extension of pensionary benefits to the families of missing NPS employees will be considered based on the NPS rules being finalized by DP&PW. This is for your kind information. 1. Pr. CCAs/CCAs/CAs/AGs/Administrators of UTs. i) Sr.PS to CGA, O/o the CGA, Mahalekha Niyantrak Bhawan, E-Block, General Pool Office (GPO) Complex, INA, New Delhi. ii) PS to Addl. CGA, Mahalekha Niyantrak Bhawan, E-Block, General Pool Office (GPO) Complex, INA, New Delhi. iv) The Director, DP&PW, Lok Nayak Bhawan, Khan Market, New Delhi - 110003.